The Baseball Hall of Fame announced its list of players who will be considered for induction in 2018 on Monday. The Baseball Writers Association of America will have 33 players to consider, including 19 who will be making their first appearance on the ballot. Chipper Jones, Jim Thome, and Omar Vizquel are among the first-time nominees who may have a chance of earning entry into Cooperstown in their first year on the ballot. Jones, of course, was the face of the Atlanta Braves for nearly two decades. He finished his career in 2012 with over 2,700 hits and 468 home runs. With one MVP award and one batting title to his name, Jones isn’t a lock for the Hall of Fame, but he’s likely to warrant serious consideration for voters. Thome is in a similar boat. With 612 career home runs, he would appear to be guaranteed a spot in Cooperstown. Of course, Thome also played in the steroid era, so those home runs could be devalued some in the eyes of voters. It should be noted that Thome has always denied using performance-enhancing drugs and has never been directly connected to banned substances. Vizquel, meanwhile, is a Hall of Fame candidate because of his defense. In more than 20 major league seasons, Vizquel won 11 Gold Gloves as a shortstop. He’s also the oldest player to ever start a game at shortstop and the only player to start a game at shortstop in four different decades. Of course, those three are not the only newcomers who will warrant serious Hall of Fame consideration. Chris Carpenter, Livan Hernandez, Jamie Moyer, Johan Santana, Kerry Wood, and Carlos Zambrano are the most notable pitchers joining the ballot this year. As a two-time Cy Young winner, Santana is the most intriguing pitcher on the list. He lacks the longevity that some voters feel is necessary. But there’s no denying Santana was one of the most dominant pitchers of his generation. 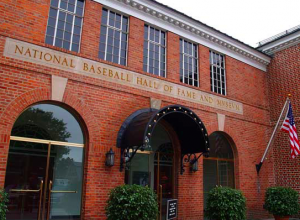 Among the position players who have a chance to reach Cooperstown are Andruw Jones and Scott Rolen. Both were generational talents defensively. In fact, one could argue that Jones is one of the greatest defensive center fielders of all time, at one point winning 10 straight Gold Gloves. Of course, several returning players also have a legitimate chance to earn 75% of the vote and receive an invitation to Cooperstown. Closer Trevor Hoffman probably has the best chance after receiving 74% of the vote last year. Vladimir Guerrero is another play to watch closely after he earned 71% last year. Of course, Barry Bonds and Roger Clemens are always fascinating figures during Hall of Fame voting because of their brilliant careers but close connection to PEDs. Both received roughly 54% of the vote a year ago and will need a significant increase in support to get to Cooperstown. Finally, both Fred McGriff and Edgar Martinez are in their final year of eligibility. Martinez is within range after getting 58.6% of the vote last year. McGriff, meanwhile, is a long shot after getting just 21.7% of votes last year, although he deserves much better than that. It’s tough to foresee how the voters will lean toward certain players. However, it wouldn’t be surprising to see four or five players receive the necessary votes to be inducted next summer. We’ll find out when the votes are revealed on January 24.